This circuit is pretty simple, where it has a 555 IC, a couple of passive components, a motor, two transistors (to drive the motor) and a power supply. We’ve recently published a car wiper control using Arduino -which you can check if you’re interested. For setting the device first find out how much time it is required for the wiper to complete one sweep cycle.Now adjust R3 such that wiper makes correct one sweep cycle.Fix R2 some where on the dash board.And now the system is ready to use. 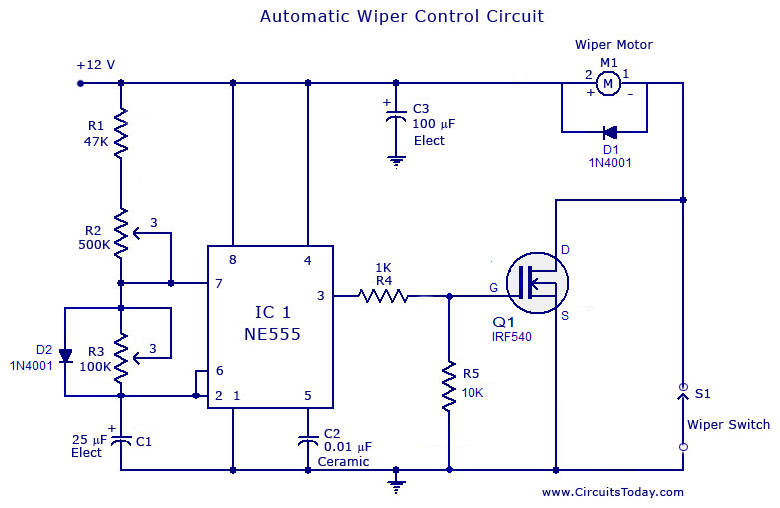 Â Modified Version of the wiper speed control circuit. A modified version of the wiper speed control circuit is shown below. A diode is added across R3 makes the charging time and discharging time independent of each other. A freewheeling diode is added across the wiper motor. The transistors are replaced by a MOSFET for better switching characteristics. I recommend this circuit over the previous one. I’m designing the similar system which a wiper motor is used. In my design I wanna sort some stuff on conveyor in two different lanes(two different conveyors). So a wiper will sort all items according to their barcodes. basically I wanna control the process from my PLC and it is able to provide signal to your circuit(replacing with wiper switch). Do you think it’s possible to use your circuit in this case? why we use 100 uf capacitor? intermittently. if the motor automatically connecting with the vehicle’s body that is usually -ve grounded, may be the circuit effective? I tried this circuit but I am not successfully made it. I used 6110 transistor and I don’t know about 2n3055 because it is available in two types, one is in big size and packed in metal body and another is a small three pin Transistor.please tell me whats wrong with my circuit? suppose i need To make my wiper move clockwise for 1s and anticlockwise for another 1s. so please tell me the value of r1 & r2. moreover voltage at motor m1 2 is at 12V and 1 is at 0v So how is it motor going to change…. Ya 12v motor only 12v motor ok! Ciekawy wpis i przydatny wykres. it is projected onto the wafer with intense ultraviolet light. The parts of the chip that are exposed to the light are then etched with gases and showered with ions to create transistors (see microprocessor). The transistors are connected when later cycles of the fabrication process lay down metal and insulation. Chip manufacturers fabricate chips in extremely clean environments because a single speck of dust can ruin the design of a chip that relies upon millions of microscopic electronic components. I am a Sri Lankan who owns a 1980 Nissan Patrol 160. When I bought this 12 years ago most of the electric control modules were missing, including the wiper control module. 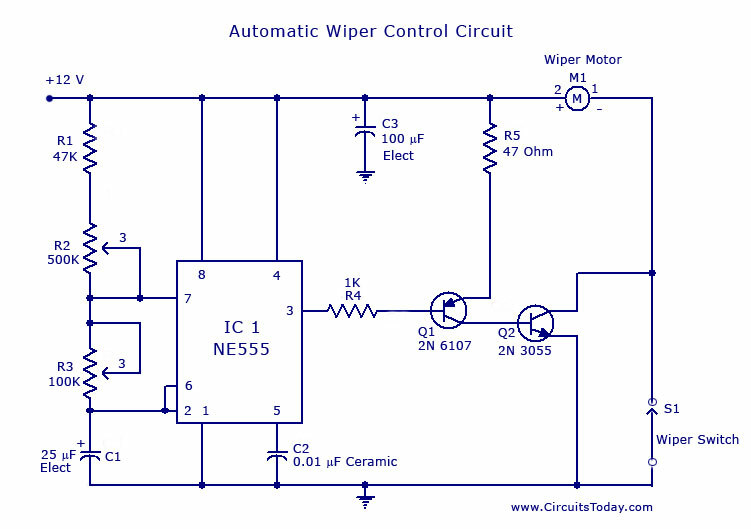 I am interested in putting up this wiper control circuit published in your website. But my vehicle runs with 24 volts. Can anyone help me adjust the circuit to suit 24 volts? I greatly appreciate. Ya the circuit can be used on 24 v dc.But some changes should be made for this,1.use 7812 voltage regulator before the main supply.but let me know about you’r car battery. is there two battery inside the bonnet?If yes then use 7812.and if there are only one battery inside the bonnet then you don,t need to do changes in circuit.